Hardened Buildings to hid your Vehicles Mecha or Infantry in. 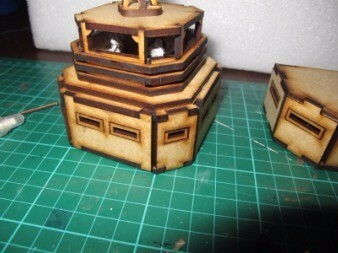 PACK01 2 x Hardened Mini Mecha Shelter (12W x 10H x 10cmD), Door is 7cm height, Has 4 optional Buttress. PACK02: 4 x Hardened Vehicle Shelter (5H x 11W x 9cmD) Pack includes extra pair of door ends, in case prefer double end shelter.